1) The yellow sweet potato, the one commonly called sweet potato, has a thicker skin and firm yellow flesh that’s a bit drier and starchier than the orange one. 2) The orange sweet potato, also called “red garnet” and “jewel,” has a softer skin and a deep orange flesh that when cooked, becomes very soft, almost like mashed potatoes. Plus they are sweeter than the yellow ones. These deeper colored sweet potatoes have more vitamin A than carrots. 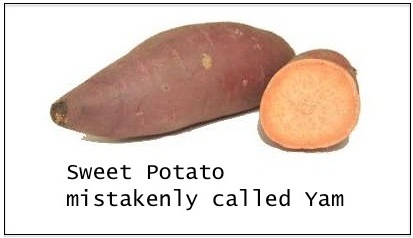 3) Yams, which have a black bark-like skin, are native to Africa and Asia and I doubt if you could even find one here in the U.S.
There’s so much confusion about the difference between a yam and a sweet potato. 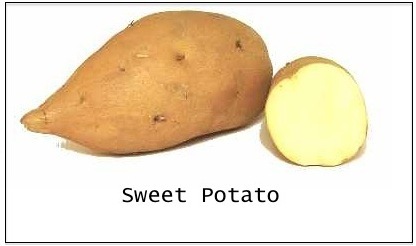 That’s because the USDA labeled the orange ones “yams” to differentiate the two main varieties of sweet potatoes but the truth is, sweet potatoes and real yams are not even related. Most of us have never even eaten a yam. So the bottom line is… unless the Supreme Court intervenes, we will continue to call the yellow ones sweet potatoes and the orange ones yams. It’s just simpler. The good news is they are interchangeable in most recipes, even candied yams. Besides vitamin A, these vegetables have lots of fiber, calcium, iron, and vitamin E so try to cook with them all year. 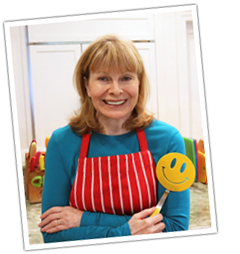 I use the yellow ones for sweet potato fries and with my roasted vegetables and the orange ones for baking my sweet potato chocolate cake. Well, this is good information but it doesn’t really change anything, does it? Happy Thanksgiving! 3 Comments on "The Difference Between Yams and Sweet Potatoes"
That was interesting, thank you. I like the Orange ones. For a healthier holiday “yam” dish, we cut up apples, onions, and Orange sweet potatoes into 1/2 inch cubes. Mix with coarsely chopped garlic , pepper,walnuts and Olive oil. Roast about an hour.